I like this packaging from designer Valeria Stroukova. She has done away with the basic rectangular box in favour of a finger form, plus she has introduced a range of different tones – the Pantone touch! There are three distinctive pigments in which the plasters would come. Pale, medium and darker skin tones. The cylindrical cartons remind us of our fingers where we often have “bo-bo’s” (French word for small cut or injury) and the pack also uses less material. 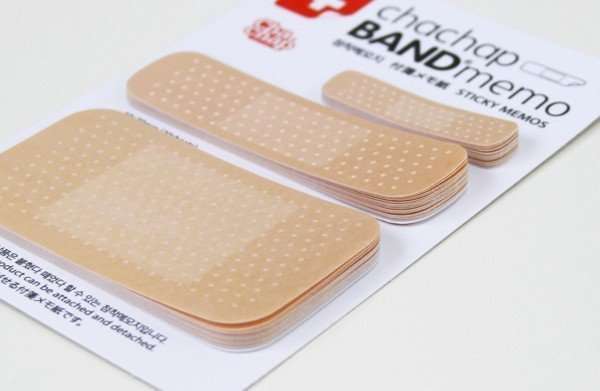 And here’s another project using plasters to bring the “First Aid touch to your Notes. Why use a Post-It, when you can patch things up with a Band Memo! One year. One word. Un an. Un mot.